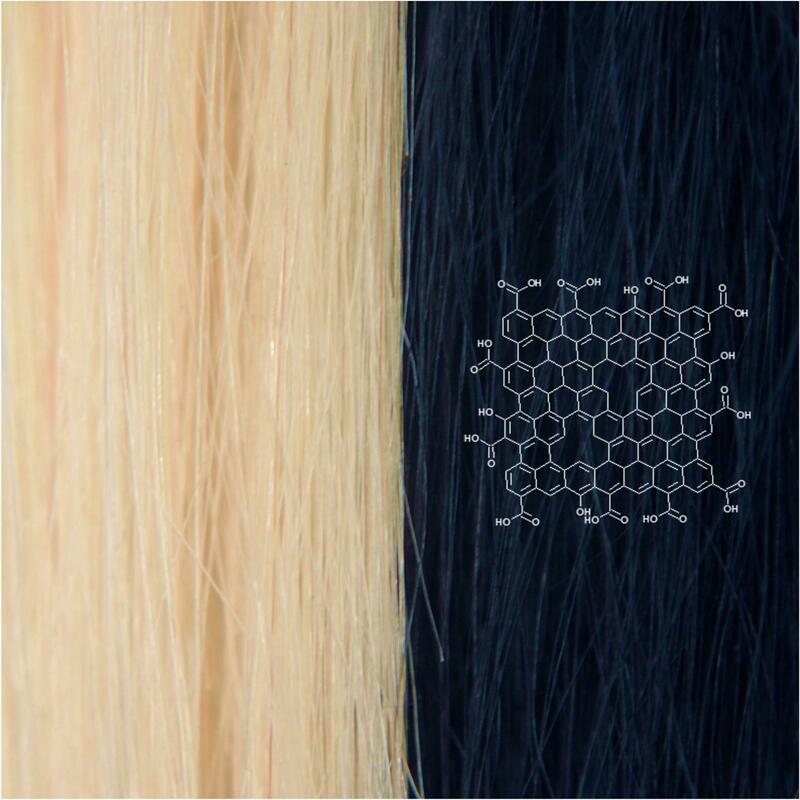 Graphene, a naturally black material, could provide a new strategy for dyeing hair in difficult-to-create dark shades. And because it's a conductive material, hair dyed with graphene might also be less prone to staticky flyaways. Now, researchers have put it to the test. In an article published March 15 in the journal Chem, they used sheets of graphene to make a dye that adheres to the surface of hair, forming a coating that is resistant to at least 30 washes without the need for chemicals that open up and damage the hair cuticle. Most permanent hair dyes used today are harmful to hair. "Your hair is covered in these cuticle scales like the scales of a fish, and people have to use ammonia or organic amines to lift the scales and allow dye molecules to get inside a lot quicker," says senior author Jiaxing Huang, a materials scientist at Northwestern University. But lifting the cuticle makes the strands of the hair more brittle, and the damage is only exacerbated by the hydrogen peroxide that is used to trigger the reaction that synthesizes the dye once the pigment molecules are inside the hair. These problems could theoretically be solved by a dye that coats rather than penetrates the hair. "However, the obvious problem of coating-based dyes is that they tend to wash out very easily," says Huang. But when he and his team coated samples of human hair with a solution of graphene sheets, they were able to turn platinum blond hair black and keep it that way for at least 30 washes–the number necessary for a hair dye to be considered "permanent." This effectiveness has to do with the structure of graphene: it's made of up thin, flexible sheets that can adapt to uneven surfaces. "Imagine a piece of paper. A business card is very rigid and doesn't flex by itself. But if you take a much bigger sheet of newspaper–if you still can find one nowadays–it can bend easily. This makes graphene sheets a good coating material," he says. And once the coating is formed, the graphene sheets are particularly good at keeping out water during washes, which keeps the water from eroding both the graphene and the polymer binder that the team also added to the dye solution to help with adhesion. The graphene dye has additional advantages. Each coated hair is like a little wire in that it is able to conduct heat and electricity. This means that it's easy for graphene-dyed hair to dissipate static electricity, eliminating the problem of flyaways on dry winter days. The graphene flakes are large enough that they won't absorb through the skin like other dye molecules. And although graphene is typically black, its precursor, graphene oxide, is light brown. But the color of graphene oxide can be gradually darkened with heat or chemical reactions, meaning that this dye could be used for a variety of shades or even for an ombre effect. What Huang thinks is particularly striking about this application of graphene is that it takes advantage of graphene's most obvious property. "In many potential graphene applications, the black color of graphene is somewhat undesirable and something of a sore point," he says. Here, though, it's applied to a field where creating dark colors has historically been a problem. The graphene used for hair dye also doesn't need to be of the same high quality as it does for other applications. "For hair dye, the most important property is graphene being black. You can have graphene that is too lousy for higher-end electronic applications, but it's perfectly okay for this. So I think this application can leverage the current graphene product as is, and that's why I think that this could happen a lot sooner than many of the other proposed applications," he says. Making it happen is his next goal. He hopes to get funding to continue the research and make these dyes a reality for the people whose lives they would improve. "This is an idea that was inspired by curiosity. It was very fun to do, but it didn't sound very big and noble when we started working on it," he says. "But after we deep-dived into studying hair dyes, we realized that, wow, this is actually not at all a small problem. And it's one that graphene could really help to solve."